St. Patrick's Day is on Sunday, March 17, and everyone is going green! Stores are awash in green items, cities are preparing their St. Paddy's Day parades, Chicago is even going to dye the Chicago River green. We've been celebrating all week, with green brownies, green milkshakes, and green lunches. If you're hoping for the luck of the Irish, why not go all out and decorate your house as well? Drape some green crepe paper streamers over doorways, and switch out your regular light bulbs for green tinted ones! 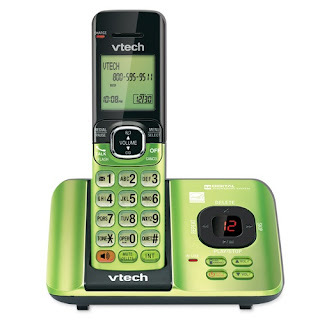 VTech even has a green cordless phone for just $19.95! We own VTech phones, so I can vouch for their quality and reliability. They look great and sound great. They're ultra-dependable and the handsets last forever on a single charge. Caller ID/Call Waiting -- Handset displays the name, number, time and date of the last 50 incoming calls. ECO mode power-conserving technology -- yup, it's earth-friendly green too! Expandable -- up to 5 additional handsets (sold separately) can be placed anywhere in your home or office near an outlet, no phone jack necessary. DECT 6.0 Digital technology -- provides superior voice and sound quality and higher protection against eavesdropping than 2.4GHz and 5.8GHz phone systems. One lucky Bonggamom Finds reader will receive a VTech CS529-14 Cordless Answering System with Caller ID/Call Waiting. Leave a comment on this post and tell me how you and your family plan to celebrate St. Patrick's Day. 4) Pin this giveaway on your Pinterest board (1 entry). This giveaway ends at 11:59PM PST on March 28, 2012; I will draw a winner at random on March 29 and post his/her name after she/he confirms acceptance. Continental US residents only. For additional giveaway rules, click here. Disclosure: I received a product sample from VTech to facilitate my review, but have not been paid to review the product or give my opinions. Thanks to VTech for providing the giveaway prize. The views and opinions expressed here are my own. Originally published on 2013-03-14 by Bonggamom at Bonggamom Finds .